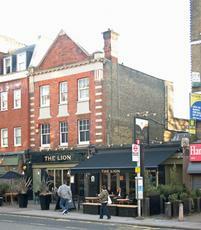 I've been going to this pub since it was the Lion. Now it's been done up and seemed to be nice enough when we first went back. However, today we had a really bad experience there and we won't be going back. We sat down at a table and were there for some time before being told that the table was actually reserved. There were reserved signs on a few other tables but not this one. Basically the manager had forgotten to put a sign on our table, and tried to shift us into a much smaller space where we would be really cramped. We said were weren't happy and were basically told tough luck. The word 'sorry' was spoken, but clearly not with any genuine feeling. only problem with this place is that the bar isnt big enough to accomodate the number of people it can hold leading to long waiting time at the bar. nice outdoor area out back, split on 2 levels. all in all a very nice place to drink, atmosphere friendly and lively without being overbearing. This Bar was once in my family as the Black Lion i used to see my God Mother who lived upstairs in the apartment every time i visited as a young boy i was given present of money me and my sister wood play in the dum waiter going up and down and getting told off , now i like to go for a pint when i come down to LONDON . i find the staff real nice ,all the family meet up as my sister still live in West Hampstead i now live in Hull .